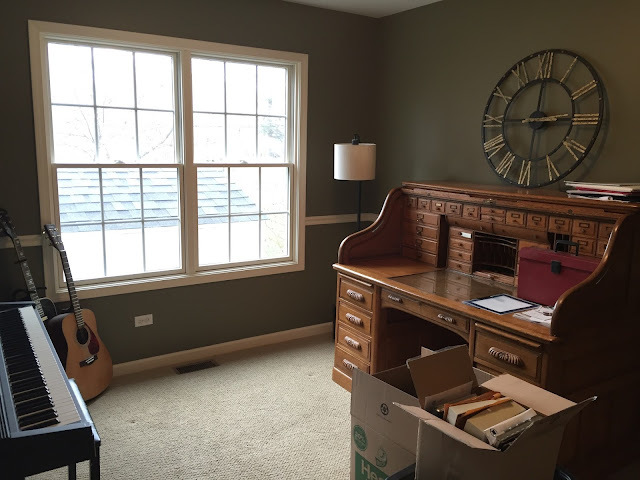 Before I dive into the details of this room makeover let's take a quick peek at the before picture shall we? 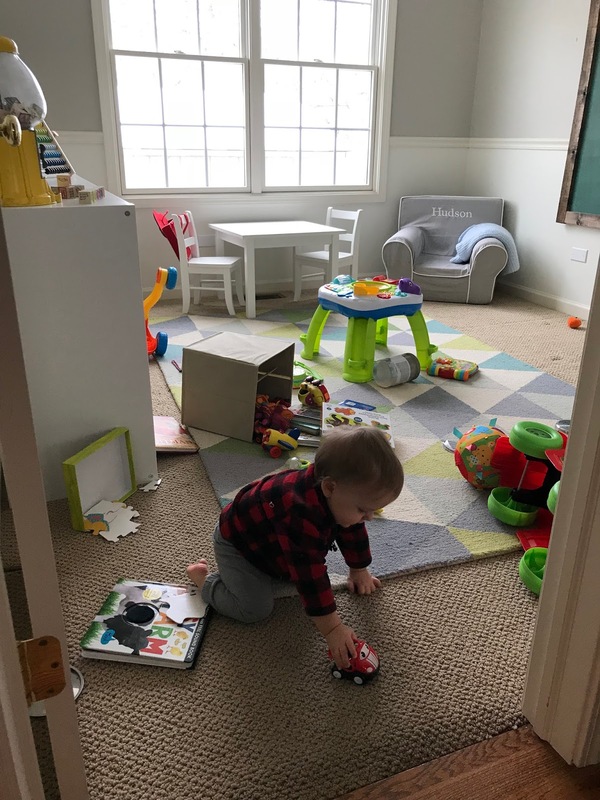 A month ago this is what the playroom looked like as an office. This is what the room looks like now! Complete with baby handprint on the glass. The first major change I made to this room was painting the walls. I chose Benjamin Moore's Revere Pewter for the top and Benjamin Moore's White Dove for the bottom. To give the bottom part of this wall more depth I decided to add 'Sharpie Shiplap'. Haven't heard of this concept? Well, it's the poor man's shiplap walls. I have a full tutorial on Sharpie Shiplap coming later this week. I found this rug online at Rugs USA when they were having a major after Christmas sale. I love that it adds color and texture while also keeping with my neutral loving color scheme. 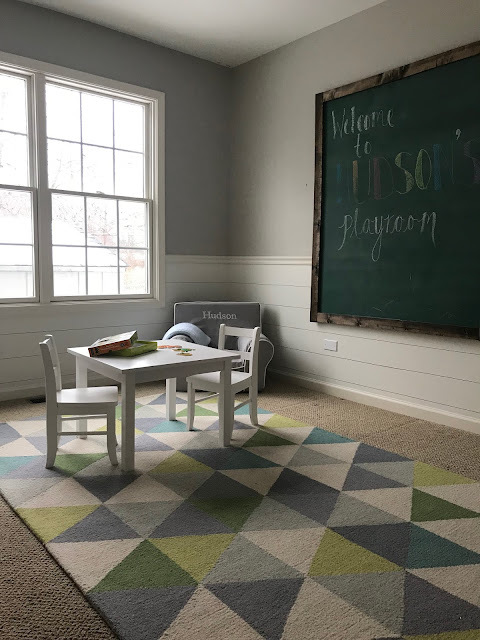 I chose to keep most items neutral in this room because I knew that Kid's toys would bring it lots of color. 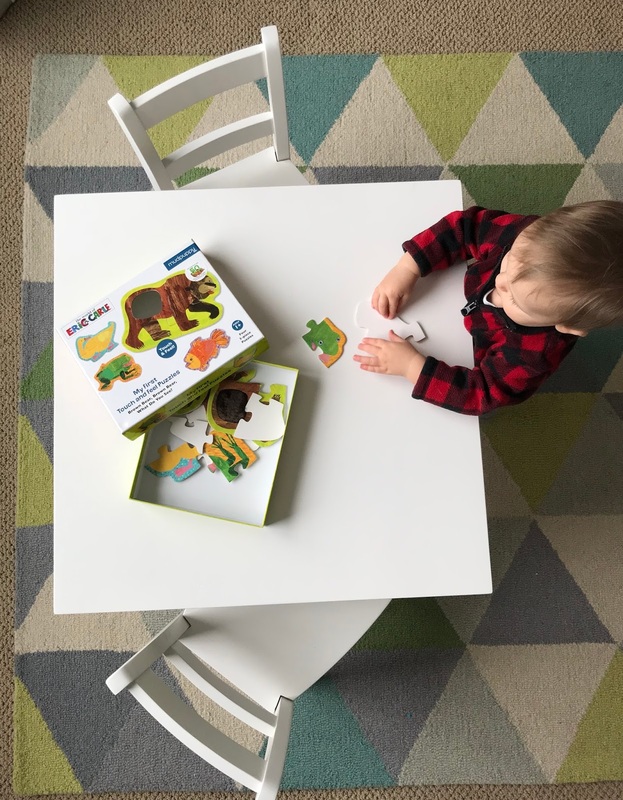 This adorable table and chairs were a gift for my son for his 1st birthday (which hasn't happened yet.... he got them early!) 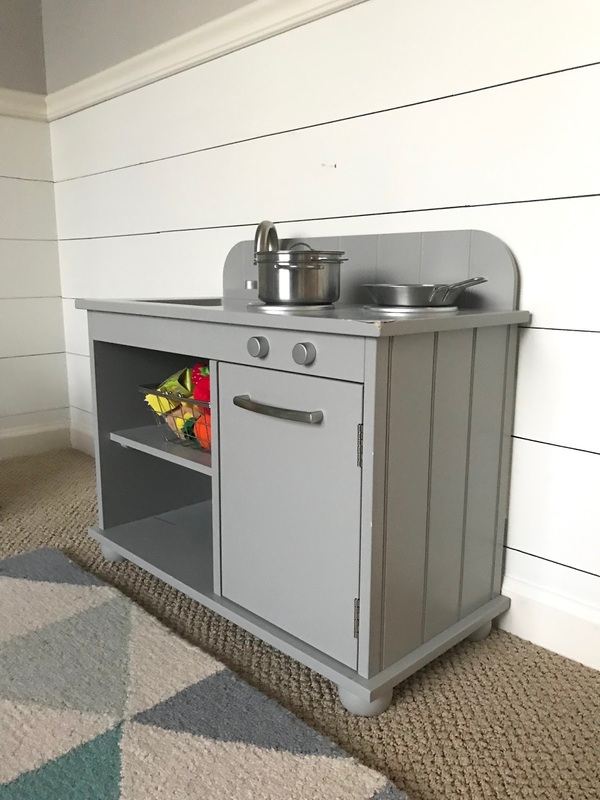 along with this so so cute mini kitchen! Both items are from Pottery Barn Kids. One of my favorite parts of this room are the DIY touches I have added. I made this oversized chalkboard, this map art and these numbered storage bins. I love doing projects like this myself in order to save money but also to put my mark on each space. I added lots of fun decor elements to this room to add in pops of color. I found this fun abacus from Ikea! 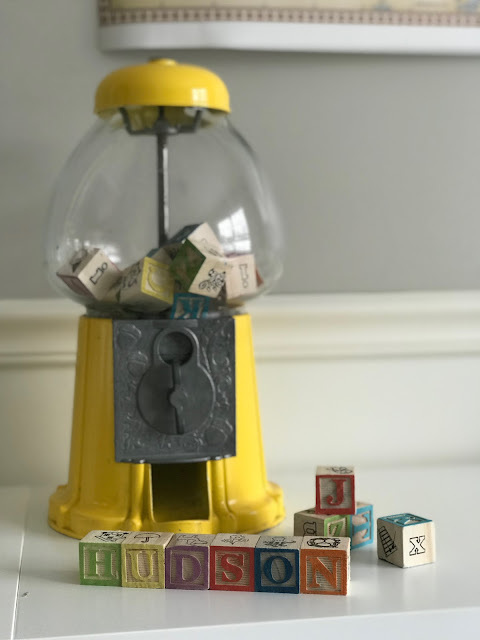 I scored this adorable gum ball machine from a thrift store back in October with hopes of turning it into a snow globe- but I think a wooden block holder is even better! And I scored these adorable wooden block's from Target's dollar spot. The last change I made to this room was switching out the light fixture. The old one just was not cutting it. Not only was it a one bulb fixture but it was much too traditional for this whimsical space. I found this industrial farmhouse style light from Lowe's and I feel like it transforms the space! And just to prove that playing actually happens in this room here are a few pics of my little enjoying his new playroom! 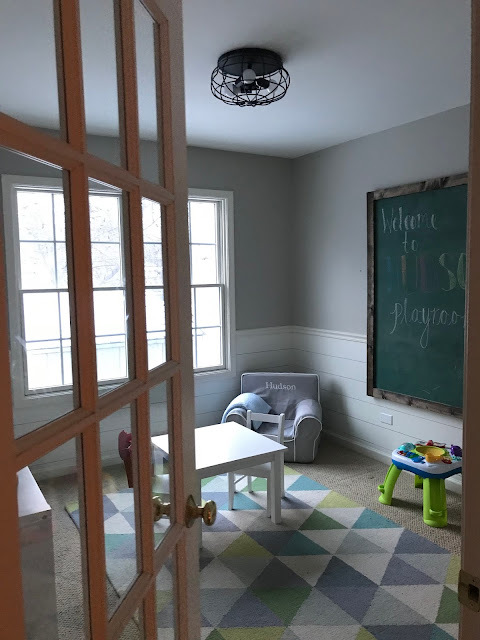 I am so happy with how this room came together and ever more happy to have a designated space for my son to play to his hearts content! 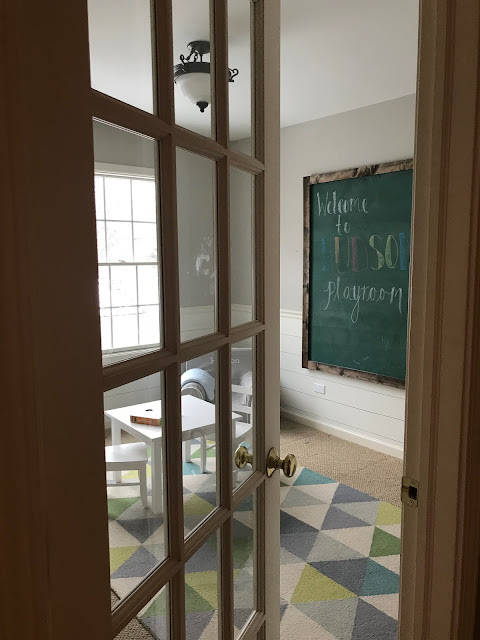 I see so much FUN happening in this room! I could have saved a bit of money by not adding things like the rug and new light fixture- but those are two of the things that can make the biggest impact! I was fortunate to be doing this makeover right after Christmas so we had some gift cards and holiday cash to put towards this makeover otherwise it may not have happened (always on a budget over here!) but I am glad we went 'all out' for this room because it turned out to be such a wonderfully happy space! 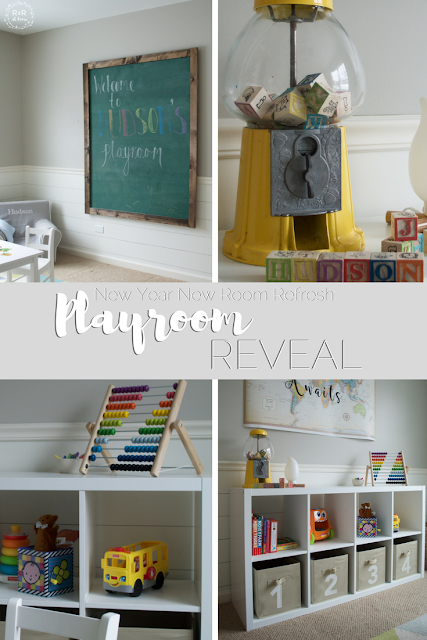 I would love to see your playroom makeovers! Share them with me in the comments below! such a colorful and fun room! great job! What a transformation!! I love how clean and fresh it is with fun pops of color. Pinning. Thank you so much! It was so fun to transform! This such a cute room! I'm new to your blog and was searching for the "Sharpie Shiplap" tutorial you mentioned. I'm not able to find it - can you point me in the right direction? Thanks!